LOL Surprise Pets Series 3 GOLD RARE Crystal Bunny Fuzzy Dolls Mostly Sealed! LOL Surprise Lil Sisters, Brothers & Pets Makeover Series 5. Fast shipping. New ListingLol surprise lot, CHEEKY BABE. Color changing dolls & pet. Rare set of 3. Trending at $34.95Trending price is based on prices over last 90 days. LOL Surprise! # Hair Goals Makeover Series 5 Big Sister Doll SHIPS FREE NOW!!!! New ListingLOL Surprise dolls, WITCHAY BABAY big, Lil & their pet. 3 color changers. 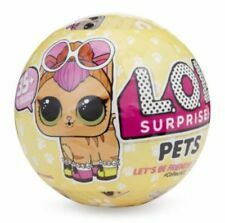 LOL Surprise Doll Pets Series 3 L.O.L. - 7 Surprises! LOL SURPRISE FUZZY PETS MAKEOVER SERIES LOT of TWO (2) for . . . . . . . . . . .
Over 700 Sold-Guaranteed Authentic-Buy with Confidence! Lol surprise dolls, FIERCE. Big, Lil & pet. 3 color changers. Fast shipping. Trending at $15.99Trending price is based on prices over last 90 days. New ListingLol surprise lot, PHAROAH BABE. Big, Lil & pet. Set of 3. Ships Fast. LOL SURPRISE! LILS MAKEOVER SERIES! Brand New Unopened! Trending at $21.00Trending price is based on prices over last 90 days. LOL SURPRISE! CONFETTI POP! 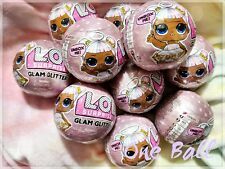 SERIES 3, WAVE 2 - BIG SISTER DOLL BALL! REAL MGA! NO DUPLICATES GUARANTEED IF YOU BUY MORE THAN ONE BALL! This page was last updated: 18-Apr 06:49. Number of bids and bid amounts may be slightly out of date. See each listing for international shipping options and costs.